Two Palestinian hunger strikers, Ahmad Abu Fara and Anas Shadid, rejected an Israeli proposal to issue a final four-month administrative detention order against them, and release them in early June of 2017. The two, who have been on hunger strike for 70 days, since 25 September, are currently in a severely critical health condition. Both are held at Assaf Harofeh hospital, and insist on continuing their strike until they achieve their freedom. According to Mohja Al-Quds Foundation, this proposal was made in writing, and includes a one-time four-month renewal of each of their detention orders. The foundation said that the strikers consider this offer to be “not serious or feasible,” as the objective of the strike is to win their freedom — not to renew their imprisonment without charge or trial. Their administrative detention orders, in place since 2 August, have been “suspended” due to their health condition; however, if they end their strike and recover, their detention will be reimposed upon them. Ahmad Abu Fara, 29, was seized from his home in the village of Surif near al-Khalil on 2 August, in a violent pre-dawn raid by occupation forces. Previously imprisoned for 2 years, he was ordered to six months in administrative detention without charge or trial. Anas Shadid, 19, was seized on 1 August by occupation forces from his family home in the village of Dura near al-Khalil, and also ordered to six months in administrative detention. Both are imprisoned without charge or trial, two of approximately 700 Palestinians held under Israeli administrative detention. A number of Palestinian organizations have warned that the two strikers face threat of death at any time. Assaf Harofeh hospital itself underlined their critical condition, including severe weight loss, pain, inability to see, shortness of breath and irregular heart rate. They are threatened with forcible treatment and forced feeding. At Friday prayers, held outside the International Committee of the Red Cross in Gaza City, hundreds of Palestinians expressed their support for Shadid and Abu Fara, urging their freedom. Speaking at the event, Khaled al-Batsh of Islamic Jihad noted that the Israeli occupation is full responsible for any harm that befalls the two strikers. Another protest will gather on Monday, 5 December at the ICRC. 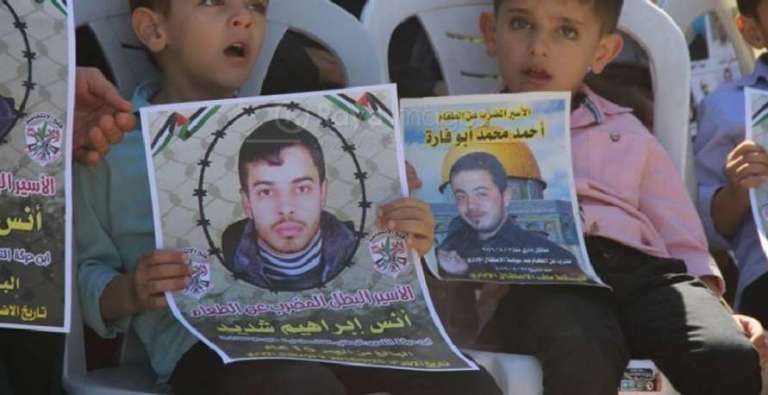 Also on hunger strike for 14 days is the Palestinian administrative detainee Ammar Ibrahim Hmour, 27, protesting the renewal of his imprisonment without charge or trial, and demanding release. From the town of Jaba, near Jenin, Hmour is currently being held in isolation at the Negev desert prison. He has been held without charge or trial since 16 February. via Samidoun Palestinian Prisoner Solidarity Network.